We are thrilled to invite all Vermont-based alums from the Vermont Studio Center to submit work for inclusion in a juried exhibition of work by VSC alums from 1989 to present. The exhibition will run from April 19th - May 17th, 2019 at Vermont Studio Center in Johnson, VT.
All media in 2D and 3D forms will be considered. Video/animation/time based work may not exceed five minutes in run time and monitors/hardware will need to be supplied by the artists. Outdoor sculptures will be considered and must be suitable for all weather conditions, be able to be secured safely, and remain maintenance free during the exhibition period. Please submit up to 3 images (5MB or smaller), of artwork that would be available for the exhibition in April, if selected. Artwork must have been created in the last 5 years. There is a $10 application fee to enter, which goes directly to the cost of the SlideRoom application. All applications must be submitted electronically by 11:59 pm, Tuesday, March 5, 2019 in order to be considered. We cannot accept paper applications. Work dropped off without proper submission through SlideRoom cannot be accepted, no exceptions. Open to all VSC alumnx* currently residing in Vermont. Past and current VSC employees residing in VT are welcome to apply. *Alumnx is a gender-neutral term that embraces the full spectrum of gender identities within our community. Applications must be submitted online via SlideRoom: https://vsc.slideroom.com/#/permalink/program/47425/PVe3VxiX80. There is a $10 application fee which goes directly to the cost of the SlideRoom application. All media will be accepted and applicants can submit up to three work samples plus a current CV. Work must be completed within the last five (5) years. April 19th - May 17th, 2019. Opening Reception Sunday, May 5th (2-4pm). Works are juried for inclusion from the electronic submissions, awards are juried from actual work. Meg McDevitt works primarily with drawing and sculpture. She graduated from Cooper Union and the Pennsylvania Academy of the Fine Arts. Meg teaches full time in the Department of Art and Art History at the University of Vermont. She lives in Johnson and has an art studio in Eden, Vermont. Andrea Pearlman is a painter and Johnson, VT resident. Her paintings are primarily based in abstraction. She studied painting Pratt Institute in NYC where she received her BFA. Andrea founded and ran the Studio Store from 1985 to 2014. Applicants will be notified of status by email on March 18th. Please do not call VSC regarding your submission. If work is selected, it must arrive presentation ready (framed or with appropriate installation materials). Shipped work must be received by April 16th in reusable wrapping with check or prepaid label for return shipping. In-person drop-off will be held daily from April 12 - 16, from 10 am to 3 pm. Work must remain on exhibit until Friday, May 17, with pick-up times scheduled on May 18 & 19 (10am - 3pm). Artists are responsible for all costs related to round-trip shipping/delivery. Shipped works must arrive with pre-paid return shipping labels. All work must be shipped/delivered installation ready. VSC reserves the right to decline work that does not reflect the digital submission. Sold work delivery is to be negotiated between the artist and the purchaser and pickup plans must coincide with VSC’s exhibition pickup dates. Artists are responsible for liability insurance, if your require it. VSC will take the utmost care in the handling of your work, but will not be responsible for damages. Work for sale must be priced by the artist, with a 20% commission to benefit VSC. After the close of the exhibition, artists receive checks for 80% of sale price on work sold. Commissions on sale of work will support the Vermont Artists Week program at VSC. If work is not for sale (NFS), value must be stated for insurance purposes. Value of NFS works will not be made public. If sale price is not provided, it will be assumed work is not for sale (NFS). 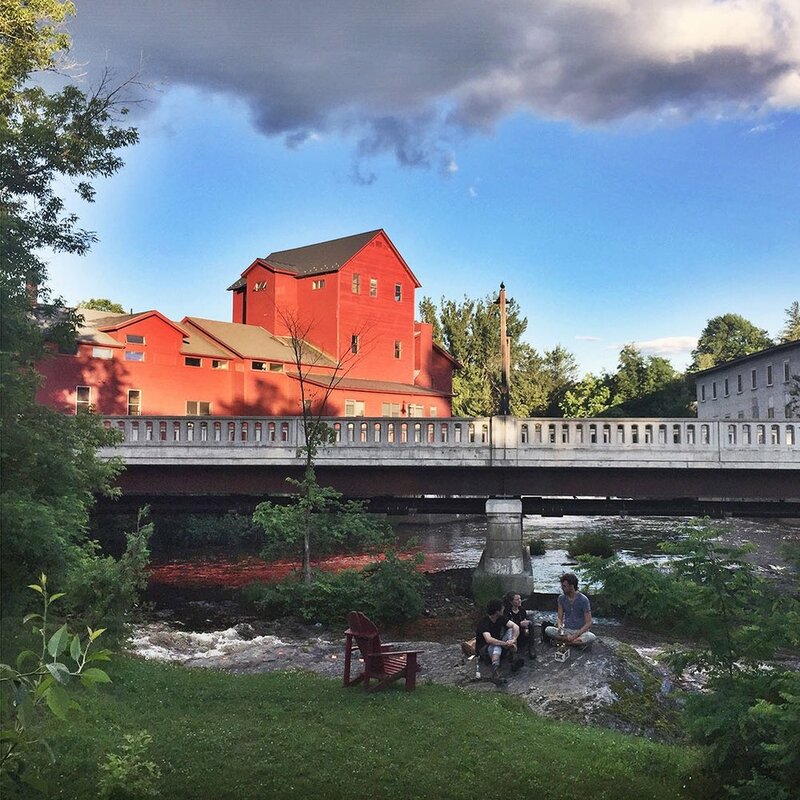 The opening reception will coincide with the 2019 Vermont Artists Week Open Studios tour and take place on Sunday, May 5th from 2 - 4 pm. All applicants for the Vermont Alumni Exhibition will be invited to meet other Vermont artists, art lovers, friends & neighbors. *Alumnx is a gender-neutral term that embraces the full spectrum of gender identities within our community.